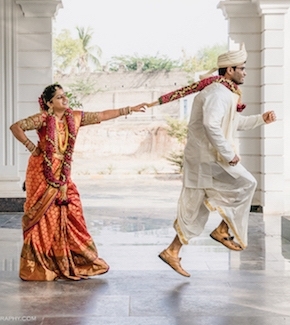 One of the most significant and much-photographed moments of a traditional Indian wedding is the pheras ritual. 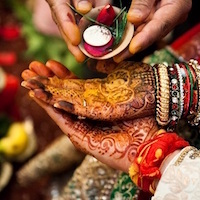 This ritual takes place around a holy fire, with the nearest and dearest ones sitting across or alongside the couple. Thus, there is little wonder as to why the mandap – the venue for this auspicious custom – has become a major focal point in weddings today. 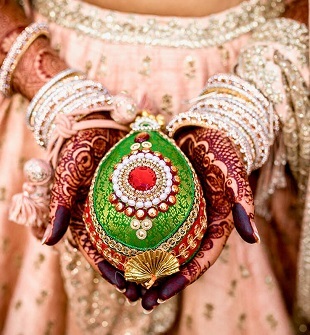 The mandap is the centre of attraction of the wedding and much thought goes into how it can be designed. This mandap is tactfully placed on a cliff-top which is perched above Jimbaran Bay, the Ayana Resort & Spa in Bali, Indonesia, this wedding mandap offers a stunning oceanfront aisle – The SKY. Jutting out from a cliff above the Indian Ocean on the quiet Kubu Beach, this multi-purpose deck offers a 180-degree view of the lush greenery, blue, clear waters and endless horizon. 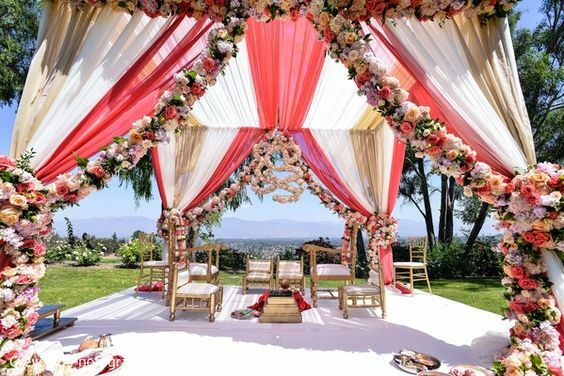 This dramatic backdrop surrounded by gardens is a perfect setting for a memorable mandap such as this light and airy one draped in coral, with elegant chandeliers and floral accents. 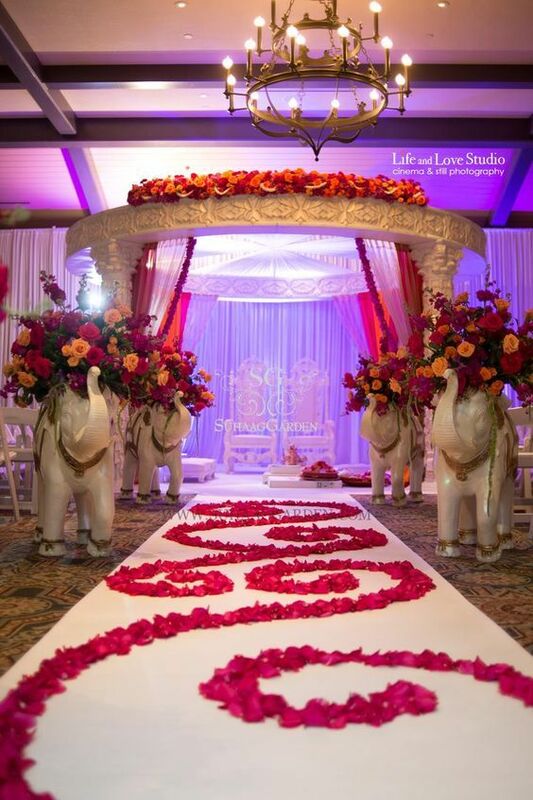 This mandap brings to the setting the essence of romance with its profusion of roses. 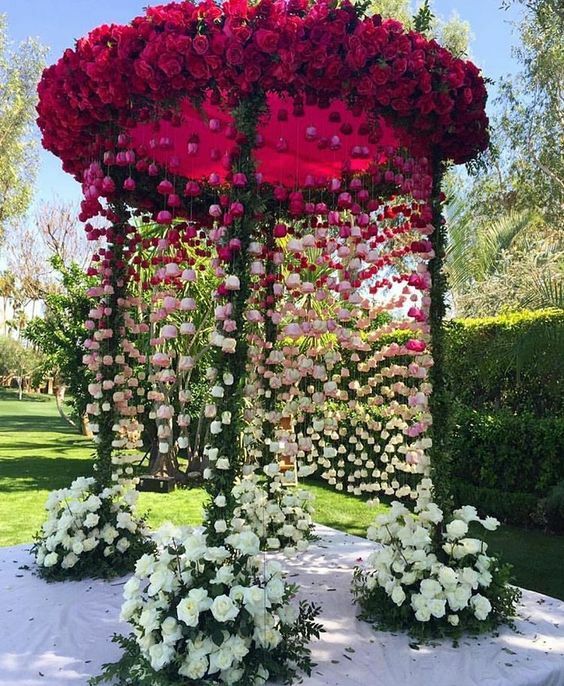 An elaborate arrangement of roses is put up on the canopy of the mandap. To add to the glamour of the roses, and bring a little shine to the red, tiny mirrors can be arranged, scattered in the canopy. Flowers arranged around the pillars, which can either camouflafe with or create a contrast to the canoopy, and festooned from the ceiling alongside dangling gold streamers, garlands and latkans make a splendid view. 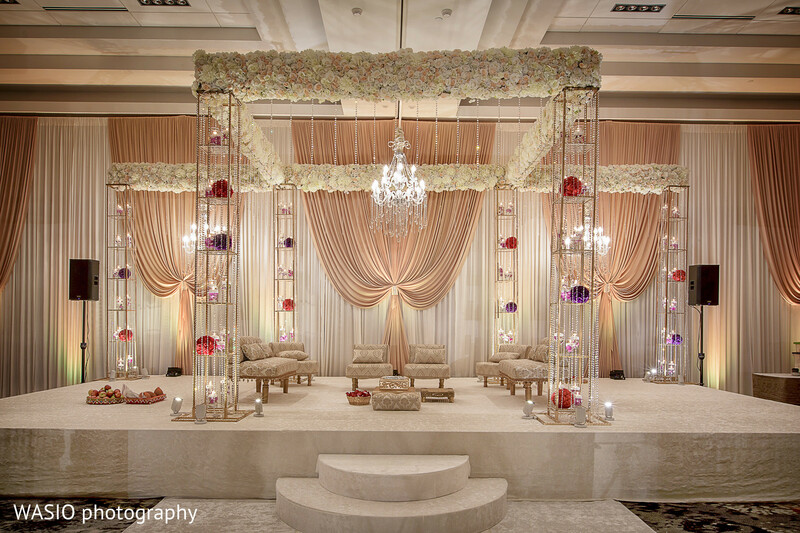 This elegant frame for a wedding mandap is somewhat minimalist but no less memorable. Creating a dome on, the white drapes are interspersed with with ivory carnations, ferns and salmon pink roses. White mandaps have become quite popular in recent years as they serve as a pristine canvas for creativity and highlight accents beautifully. This mandap, set against a gorgeous sunset provides a picture-perfect frame in any setting. It is set on a platform over the beach-facing Lotus Pond at JW Marriott Resort & Spa in Phuket, Thailand, is also backed by an ‘aisle’ of water with beautiful earthen décor and lamps along the sides. This blush-pink and stone-grey draped mandap with floral wreaths and a floral backdrop exudes freshness and femininity. 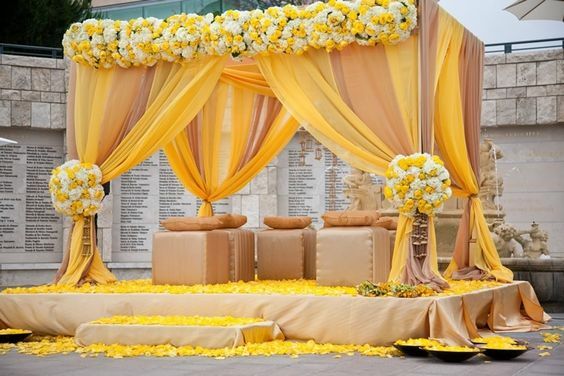 This lighter colour scheme is ideal for outdoor ceremonies. The same set-up can be put together with any other pair of elegant and contrastign colours to give the chic look. The glint of glass chandeliers and the magnificence of a minimalist flower decor merge dramatically in this stunning wedding mandap. This can be ideal for an outdoor wedding, set in the evening in the backdrop of a clear night sky or maybe in the backdrop of hills. Even an indoor wedding does not fail to do justice to this set up. 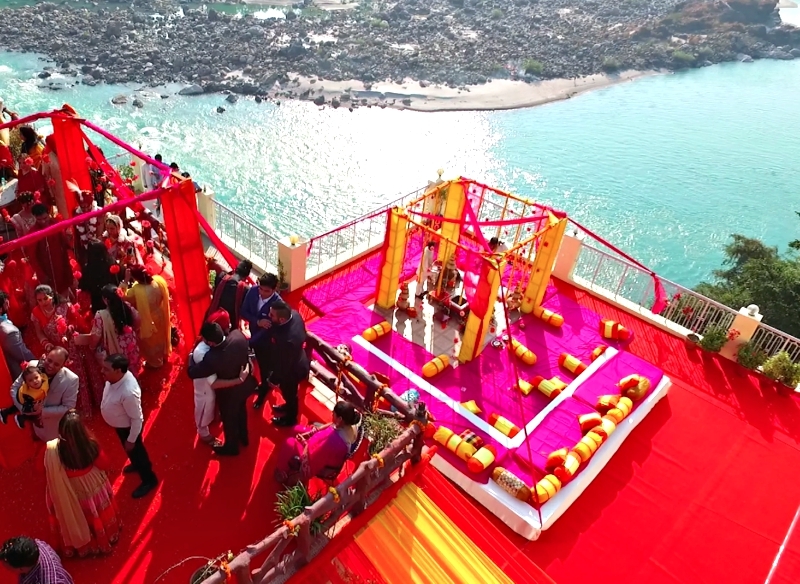 This lakeside mandap is charming and colourful with pretty streamers in the background and flowers festooned in a stunning arrangement from the roof. The reflection of this eye-catching mandap over the pool adds to the stunning effect. A sunny wedding mandap unusual yellow tent-like canopy that is festooned with floral arrangements can be just right for an outdoor wedding, most-probably one by the beach. One may add the orange of marigolds around its pillars to add a further pop of colour that contrasts beautifully with the azure sea and skies. 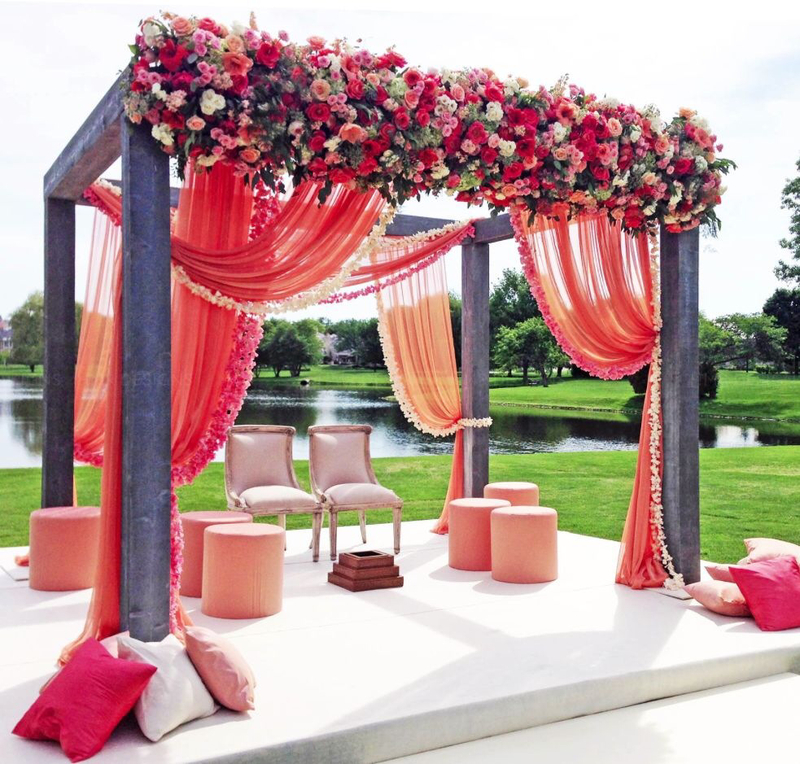 This wedding mandap which is inspired by all things pastel and pretty will give a romantic vibe, probably like one of the dreams you may have had about your wedding. 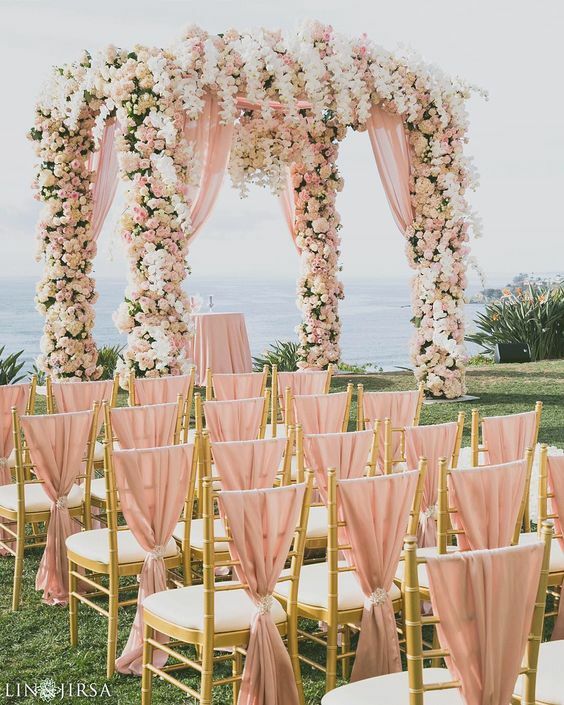 The beautifully coordinated drapes of light pink, peach and white are paired perfectly with floral arrangements and pinned around the square roof and white or off-white or cream pillars. This circular mandap is resplendent with deep red roses strung all around the roof. Skilfully lit up at night, this mandap also featured golden accents and billowing white drapes that looked heavenly against darkening skies. I, it also looks good for an indoor wedding when set against a white backdrop. 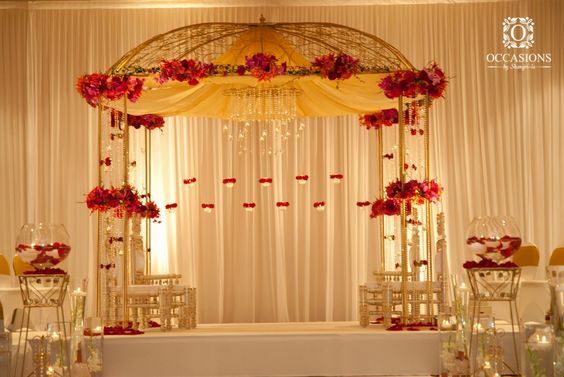 This mandap studded with exotic reds, pinks and little bursts of yellow can turn any setting vibrant. 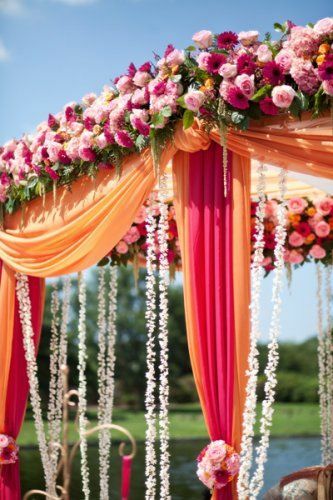 To add to the vibrance of the flowers, the pillars can be draped in bright colours of orange or a deeper shade of pink. This ensures that it is not vibrant while still being the centre of attraction. Adding a touvh of white would not a bad idea either.